Four years ago, Russia’s Luna-9 and America’s Orbiter-2 both photographed groups of solid structures at two widely separated locations on the lunar surface. These two groups of objects are arranged in definite geometric patterns and appear to have been placed there by intelligent beings. Since American space officials have chosen not to publicize these findings, our readers are probably not aware of their existence. 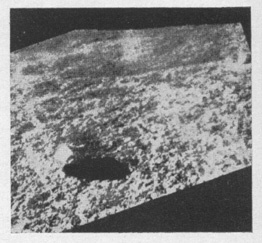 The Luna-9 photographs, taken on February 4, 1966, after the craft had landed in the Ocean of Storms, reveal two straight lines of equidistant stones that look like the markers along an airport runway. These circular stones are all identical, and are positioned at an angle that produces a strong reflection from the sun, which would render them visible to descending aircraft. 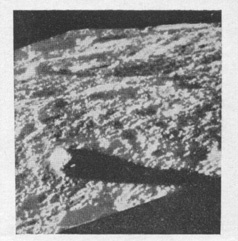 The above photo was shot by Orbiter H-2 from twenty-three miles above the lunar surface, and shows shadows cast by eight spires. According to NASA, the area photographed is about 740 by 540 feet at lunar coordinates 15 degrees 30′ E. And 40 degrees 30′ N. The sun was 11 degrees above lunar horizon. The general plan of the arrangement of these objects is shown in the diagram at the top of the page. Russian scientists who examined the geometrical relationships among the objects found that numbers 3, 4 and 5 are in exactly the same arrangement as the pyramids of Cheops, Chephren and Menkaura. at Gizeh, Egypt. Russian estimates placed the largest spire. number 7, as standing as high as a fifteen story building. The second set of photographs were taken by America’s Orbiter-2 on November 20, 1966, twenty-nine miles above the lunar surface, over the Sea of Tranquility. The photographs, of an area some 2,000 miles from the “runway” reported by the Russians on the Ocean of Storms, show what appear to be the shadows of eight pointed spires shaped like Cleopatra’s Needle (the ancient Egyptian obelisk now in Central Park in New York) and the Washington Monument. 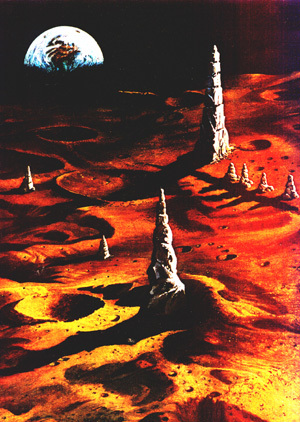 Since Orbiter-2’s cameras were pointed straight down at these spires, only their shadows are visible; but NASA stated that the sun was eleven degrees above the horizon, and from this, American space scientists estimated that the “largest protuberance” is approximately fifty feet wide at the base and from forty to seventy-five feet high. However, the Russian scientists who examined the Orbiter-2 photos disagreed with these American estimates, and said that the smallest of these eight apparent obelisks was “similar to an extremely large fir tree,” while the largest was, by their estimation, three times the height claimed by the Americans – or as tall as a fifteen-story building! We fail to appreciate such an attitude toward something of the first interest to our whole moon-probing endeavor; especially one which has been so openly investigated ,by our rivals in this effort. However, in 1968, NASA released a very remarkable publication, the “Chronological Catalogue of Reported Lunar Events.” This list includes lights, both stationary and moving, appearing on the moon and then suddenly disappearing; some perfectly circular craters that look more like domes and which are, in some cases, arranged in perfect alignment, and such phenomena as glowing mists and sudden patches of gem-colored outpourings. John O’Neil, former science editor of the late New York Herald Tribune said that he observed a gigantic bridgelike structure in the Sea of Crises (on the moon) under which the sun shone when at a low angle. This was later confirmed by other astronomers. Recent literature has been crammed with descriptions of wall-like structures that form perfect squares or rhombs; of rills that look like water-eroded river beds, arid of lines that look like roads, and even a grid of streets on the lunar surface. 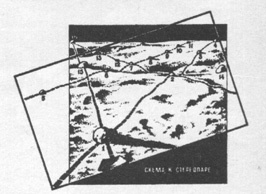 Of course, many such apparently man-made structures, seen on earth from on high, later prove to be simply natural formations, At the southern edge of the Sahara Desert in Northern Nigeria is one such natural formation, which when seen from above, appears to be an enormous layout of structured walls. The two photos at the top were taken by Soviet probe Luna-9 after its soft lunar landing in February, 1966. Photos show shadow cast by small solid object, one of a number of apparent “markers” staked out across the lunar surface nearly two thousand miles away from the site of the lunar spires. 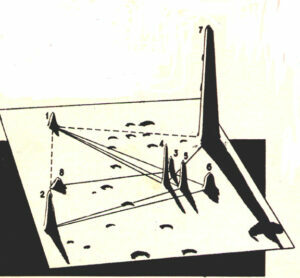 Diagram shows arrangement of stones, many of which are the same siz, shape and are set at identical distances apart. And from an orbiting space craft, the Barringer Crater in Arizona looks like an artificial construction. Despite both manned and unmanned landings on the moon, we still know very little of just what is on its surface, simply because of its size, the wide variety of its topography, and the still comparatively limited range of our probes. Suppose for a moment that the earth was probed from the moon by two manned landings – let us say in Utah and East Africa. How much would we learn of the surface of the rest of the planet? Our oceans, lakes, mountain ranges and rivers might well be spotted and photographed from on high on approach, but just how many smaller things, like pyramids and obelisks, built by thinking creatures with an intelligent design in mind, might go unrecognized; or, still worse, might even be seen and filed away simply because they did not accord with what was accepted as possible by the experts at the home base. 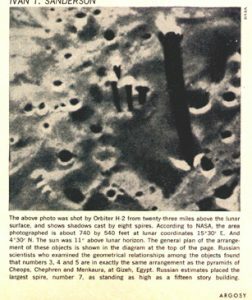 Though very little attention has been given to the mysterious moon objects in this country, both the Orbiter-2 obelisk photographs and the Luna-9 runway pictures were widely published in the Soviet Union, for Russian scientists have always been extremely interested in the pursuit of any evidence of extraterrestrial life. 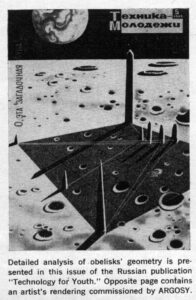 Moreover, the question the Russian scientists are now asking about these lunar objects is whether intelligent beings could have visited our moon long ago, and erected thereupon permanent monuments and landing fields. The question should not come as any great surprise to us because the Russians have long and consistently gone after archeological and historical evidence of superior life forms having visited this planet. The material amassed by them in support of such an idea is now somewhat overwhelming. For instance, they claim that many Biblical stories, such as the apparent destruction of Sodom and Gomorrah by an atomic bomb, are historical accounts of such visitations. They have reported finding metallic discs, like modern record ing platters, in Asiatic caves, and they have published reproductions of early Christian wall paintings from old monasteries in Yugoslavia that appear to show angels in space ships. Why, we may well ask, did man ever start making obelisks anyway? It’s a very tough job and seemingly purposeless. Is the origin of the obelisks on this earth, and those on the moon, the same? Could both be ancient markers originally erected by alien space travelers for guidance of later arrivals? 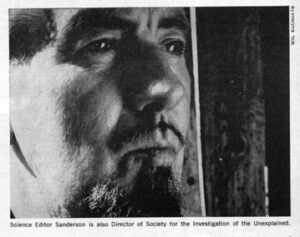 The basic information contained in this article was given to us by Lynn Schroeder and Sheila Ostrander who last year visited Russia, Bulgaria, Romania, and Czechoslovakia, at the invitation of Russian scientific organizations which had set up an international symposium covering the general field of parapsychics. They are the joint authors of a book on this subject, published this month by Prentice- Hall, incorporated, entitled “Psychic Research Behind the Iron Curtain.” The substance of this article is extraneous to this fascinating book, but it seems to us to be of great interest in this day and age of moon and planetary probes by the U.S.S.R. and ourselves.